The Clean Advantage® program is an eco-friendly program that gives fleet card users the advantage of offsetting the CO2 emissions of their fleets and vehicles. As part of the Clean Advantage® Program, both Travelcard and Tankpas.nl support a variety of initiatives, across numerous projects, that sequester CO2 locally and around the world. Travelcard, the solution for fleet owners. With Travelcard you decide. This is what makes the fuelcard perfect for large fleets. You can adjust the spending limits for each fuel card and decide which products are allowed with the card. It is even possible to block expensive fuel stations so your drivers have to refuel at cheaper locations. The Travelcard fuel card is accepted at all gas stations in the Netherlands and at 41.000 sites in Europe. Tankpas.nl the most complete fuelcard for SME. Tankpas.nl is the fastest and most complete fuel card for the SME market in the Netherlands. There is one card for refilling gas, electric charging, parking, carwash and maintenance. The card is accepted at all gas stations in the Netherlands. Uniquely, the card allows for free of charge refills of screenwash and oil! Finally, the card also makes it possible to directly compensate with carbon offsets at all gas stations in the Netherlands and at 41.000 sites in EU. As always, Travelcard and Tankpas.nl fleet cards provide you and your fleet significant savings and help you reduce your expenses. 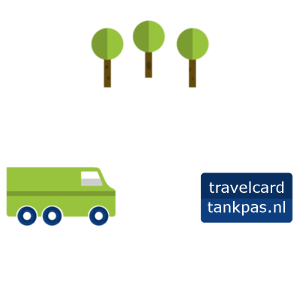 Now, with Travelcard and Tankpas.nl fleet cards your company can positively contribute to saving and protecting your community’s environment as well. Clean Advantage® is a turnkey sustainability program, brought to you by Travelcard, Tankpas.nl, and GreenPrint. This program automatically calculates your fleet’s CO2 emissions and significantly reduces your fleet emissions through proportionate investments in projects that sequester CO2 from the atmosphere, making your vehicles the cleanest on the road – even cleaner than the average electric or CNG vehicles. The Clean Advantage® program invests in many projects that not only reduce CO2, but also help to provide habitats for wildlife, clean landfills, and develop local parks and recreational space for people to enjoy. Copy the code below and add the Clean Fleet decal to your site today! We offset carbon dioxide and other greenhouse gas emissions by investing in a growing portfolio of reforestation, alternative energy, biomass, and other projects both locally and globally. By performing all the heavy lifting, the Clean Advantage® program provides a simple and powerful corporate sustainability and goodwill initiative for your company! Support – Working out the exact amount of CO2 your vehicles are producing can be a very complex process, but with the Clean Advantage® program, we take care of this worry for you. Simplicity – It is all taken care of with low cost with refueling added to your current invoice. Scale – No customer is too small, and we can also cater to larger companies with client-specific projects. Expertise – GreenPrint and The Arbor Day Foundation are world leaders in bringing reduced emissions projects, certified by United Nations protocols and governing bodies such as the Verified Carbon Standard, to fleet’s such as yourself. As a member of the APX Carbon Registry, GreenPrint has a publically visible listing of reduced emissions projects, the credits retired for their clients, and documentation relating to project length, type, auditing, and CO2 reduction. Build Goodwill – Participating in the Clean Advantage® program will allow you to market your sustainable efforts to both your customers and community. Annual Carbon Reduction E-Certificate – At your request we are happy to provide annual e-certificates documenting the exact amount of carbon your fleet has reduced over the course of the previous year. Be on the lookout for more information soon!